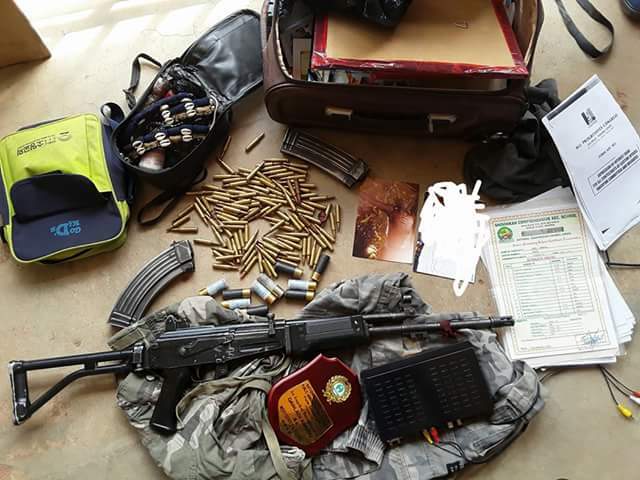 Weapons and charms recovered by Benue Police, kill one in fierce gun battle with gang members of wanted criminal "Ghana"
On August 11, The Operation Zenda Special Crack Squad of the Benue State Command engaged in a gun duel with gang members of the wanted criminal Terwase Akwaza a.k.a "Ghana". A statement issued yesterday by the Command's spokesperson, ASP. Moses Joel Yamu, said the gun battle ensued when the Crack Squad stormed a criminal hideout at a location on the border with Taraba State, following a reliable information that Terwase Akwaza aka Ghana and his gang members were holding a meeting. The bandits immediately opened fire on sighting the Police team and in the ensuing gun duel, one Danladi Awudu aka Jerry who was hosting the meeting was hit by a bullet while others escaped with bullet wounds as there were traces of blood stains all over the place, however, he was confirmed dead on reaching the hospital. The team recovered an Assault rifle No. 2051679 with one hundred and fifteen rounds of live ammunition, ten live cartridges, assorted charms, two army camouflage shorts and other items. Search for the fleeing members and the gang leader Ghana is ongoing. Recall that the police had declared "Ghana" wanted, in connection with the March 20th killing of 17 persons by gunmen in Zaki Biam, Benue.